Ride em' cowboy! 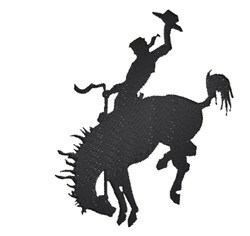 This is a cool silhouette design of a cowboy riding a bronco! Stitch this onto a cap or western shirt for your favorite cowboy or cowgirl! King Graphics is happy to present Cowboy & Bronco Silhouette machine embroidery design which has 8193 stitches and is [93.98 mm x 116.84 mm] large. If you would like to view more embroidery patterns please search on our embroidery designs page.